Interesting update for iced coffee lovers! Iced Coffee Machines were recently spotted by DFB reader Wendy in the Refillable Mug area at Captain Cook’s Snack Company in Disney’s Polynesian Resort. We did some research and are pretty sure this is a new self-service option for guests looking for a caffeine fix! With your refillable mug (currently priced at $15.49), guests can enjoy free refills on soda pop and coffee at the their resort from time of purchase until midnight of their check out day. 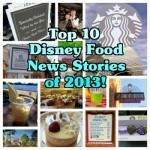 If the French Vanilla and Mocha iced coffee flavors are actually included, we know many guests will be thrilled! We’re looking forward to following all the coffee trends at Walt Disney World, including the upcoming Starbucks locations and new Joffrey’s blends. Thanks Wendy for sharing this fun information! 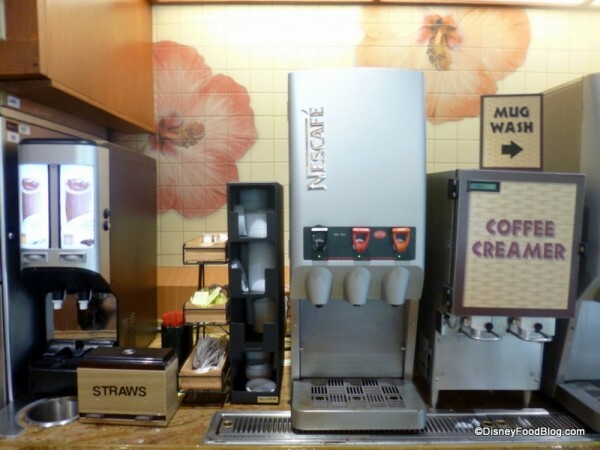 Have you seen iced coffee machines at other Disney resorts? 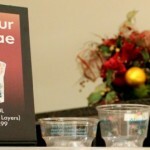 Were you able to use them with your refillable mug? Let us know in the comments below! Yes, indeed. When my family stayed at the Poly in late February/early March, we used our refillable mugs at these Iced Coffee stations multiple times with no difficulties. Does the iced coffee come with milk or can we add it separately? I don’t do dairy milk. Thanks! If they had these at the POP in August, my wife wouldbe in heaven. Anything would be better than the regular coffee. My wife was very disappointed when they took the chocolate milk machines away years ago. If they put these in all the resorts she will love it. I find it funny that everyone scoffed at nescafe, but many are excited by this. This is essentially the same thing; coffee syrup concentrate (which, in this case is sweetened with corn syrup and a variety of other chemicals.) Thanks but no thanks. On our last trip, we saw that pop and art of animation already have the Joffrey’s coffee. It was wonderful. I’ve made a few stops to the other Monorail resorts, Wilderness Lodge, and the Beach Club quite recently, and still haven’t seen them anywhere else. 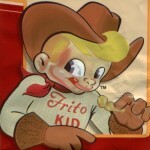 Will definitely keep an eye out, though :)! 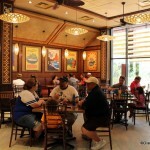 We had the iced coffee during our stay at The Polynesian in March and really enjoyed the new addition! We used our refillable mugs, I don’t know why that would even be a question, they are part of the refill options! A very welcome addition as a drink option! Sorry, but the iced coffee is not part of the plan. Wen you get your mug at the Poly, they inform you that it does not include the iced coffee. Wait… they took out the hot chocolate??????? Aww I didn’t realize it was chemically crap – thought it was maybe just sweetened cold coffee 🙁 Nevermind. I’m intrigued by the “mug wash”sign. Is that like eye wash? Seriously though, a smart addition…no more rinsing your cup in the soda fountain. Hi, Nicola! I checked at the Polynesian tonight and the Hot Chocolate is still there. It just got moved over a few feet to the right :).